The final renewal day of this page is September 8, 2003. Anax parthenope julius laid eggs in 2003/8/27 in the pond of the park of about home. I checked the stem of plant that it lays eggs. An egg-parasitoids wasp parasitized an old egg of Anax parthenope julius. An egg-parasitoids wasp parasitized one of the old egg. The larva came out from the egg on August 30. This larva became a pupa on September 2. It emerged on September 6. Ｆigure6-1: 1. Oviposition of Anax parthenope julius　Anax parthenope julius is Aeshnidae. 2. Inhabiting environment Anax parthenope julius is a common species in Kinki area. It can be seen in the pond of the park. 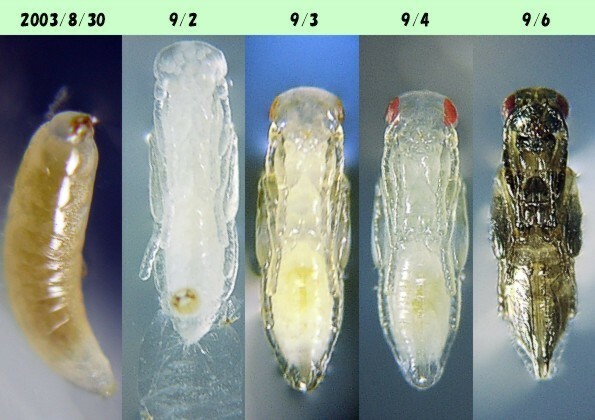 Ｆigure6-2: 1.The egg of Anax parthenope julius after the larva of the egg-parasitoids wasp went 2.The larva of the egg-parasitoids wasp which came out Size is about 1.4mm. It takes pictures in August 31, 2003. 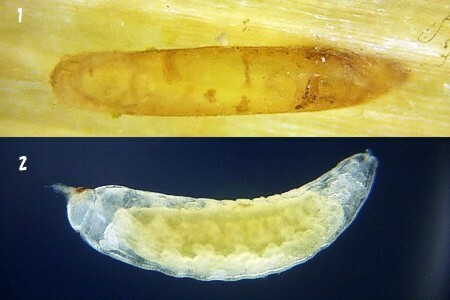 Ｆigure6-3: The larva and pupa of the egg-parasitoids wasp which parasitized the egg of Anax parthenope julius. The size of the pupa is about 1.35mm. 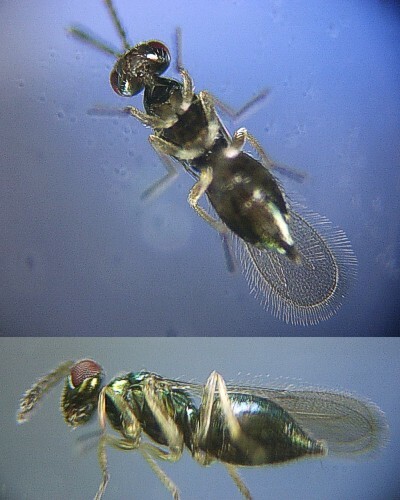 Ｆigure6-4: The female of the egg-parasitoids wasp which parasitizes Anax parthenope ｊulius This egg-parasitoids wasp often looks like the egg-parasitoids wasp which parasitizes Lestes sponsa.